November 2013 – He Said What?! Teaching our children to say thank-you was a lesson that we started at a very early age. Most parents do, I’m sure. It was so cute to hear their little voices say those words, and very gratifying as parents when they said them without prompting. Like all of life’s early lessons, though, it had to be taught. Very few children will just naturally be thankful. Sometimes Aaron is demanding. “Mom! Come here!” “Mom! Look!” Mom! Bring me my coffee!” I remind him all the time to say please and thank you. Why are those words sometimes so hard for him to say? And how often, after handing him something, do I stand there and wait? He might notice me waiting and he might not. If he doesn’t notice, I’ll eventually say those words that all of us have said many times. “What do you say?” I’ll ask. Then comes the thank-you, but not without my prompting. An unprompted, spontaneous thank-you would have meant so much more to me. How often, though, do I do this same thing to God? How like a child I am in my relationship to Him! For me, it’s easy to say thank-you for the obvious. My husband, my children, my home, my health, my friends, food……….. The list can get long. But I know there are times when God stands beside me waiting for me to say thank-you. Sometimes I just forget to say the words. Yet many times the thing He wants me to thank Him for is not something that I necessarily AM even thankful for. There He stands, waiting. Waiting on me. The eventual stirring in my heart is when I imagine Him leaning down toward me. “What do you say?” He whispers to me. And He waits for me to remember that He has said, “In everything give thanks.” Not just the obvious……….not just the pleasant……….but in everything. And when I finally remember to say thank-you, or I finally get over my hurt or stubbornness and say thank-you, I know that He is very pleased. He loves me. He wants me to know that “in everything” He has my good in mind. Saying those words isn’t a magic formula. It’s instead an acknowledgement of trust on my part. Even when I don’t feel thankful, just saying the words to Him opens my heart to a level of trust that I hadn’t known before. I trust that this thing…….this situation…….is sent from God for my good and for His glory. What do you say? Thank You, God. Thank you. What IS a Tootsie Roll?! Yesterday was a typical day with Aaron. But is any day with Aaron ever really typical? I guess that depends on your definition and experience. Let’s see……. He was up early, as is usual anymore. When he came downstairs he was full of talk concerning his keyboard, knowing that if he showers and does his other routine morning duties then Mom just might put in the keyboard so that he can play a game before we leave for his day group. I urged him to just sit awhile and take his time, and yet I knew that this could backfire on me. If I take too much of Aaron’s time, then he will get angry when he has to get off his computer later, saying that it’s my fault that he didn’t get to play longer, etc., etc. I was already into the balancing act and he had only been downstairs a few minutes. I had the radio on and was enjoying the Christmas music. “That’s dumb,” Aaron informed me in his monotone voice. “What’s dumb?” I asked, although I knew. “Playing Christmas music. It’s not Christmas yet!” he replied. No amount of cheery talk of Christmas would change his mind, I knew. I’ve allowed Christmas to come early for us this year as I’ve already worked on decorating the house, a job I’ve always done after Thanksgiving. The decorations don’t seem to bother Aaron, but the music is a different matter. It’s not the first time that he has told me that this Christmas music doesn’t fit right now. I get it, Aaron, I get it. The rest of the morning went well, with Aaron getting his chores done and then being allowed some computer time. Before we left the house, I saw that he had a small tootsie roll in his hand, which he unwrapped and popped into his mouth. “Mom, I haven’t had a tootsie roll in a long time!” he declared. And so this simple experience became of great importance as we drove to meet his group. Do any of you remember his mayonnaise/mustard dilemma that I have written about in the past? He still has such a hard time figuring out the difference in these two condiments. What is mustard? What is mayonnaise? Is mayonnaise white mustard? And at Subway he has asked for white mustard on his sandwich, to the great confusion of the one doing the sandwich fixing and the great delight of me as I have watched this scenario unfold. So the tootsie roll issue reminded me of the mayonnaise issue. “Mom, what’s a tootsie roll?” he asked. I told him that a tootsie roll is a piece of candy. Seems simple to me, but nothing is ever really so simple to Aaron. 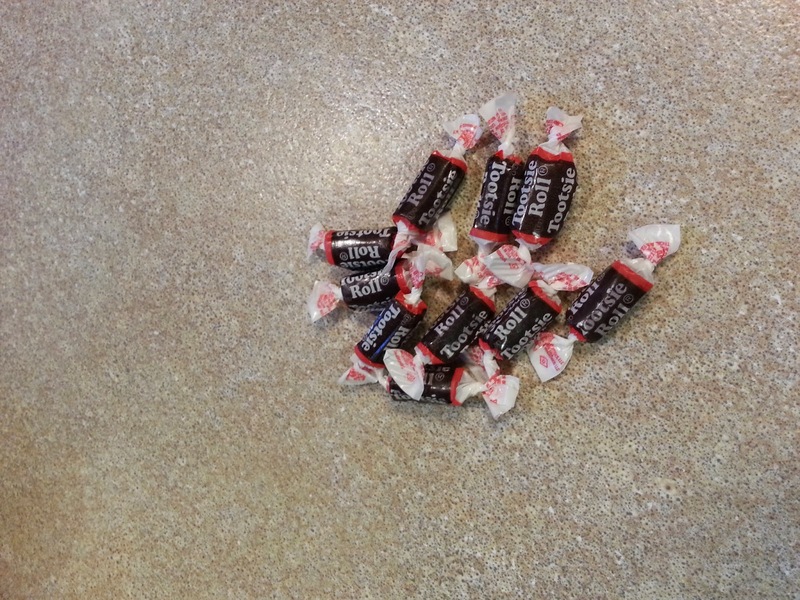 A minute later – “But what IS a tootsie roll?” OK, I thought……he needs more. “So it’s chocolate?” he asked with surprise. And I realized that we were back to square one. I hoped it was enough. It wasn’t. “So what is it?” he asked yet once again. I knew he needed more from me, but what else could I give? How else could I describe a tootsie roll to Aaron, who needed more precise information, obviously, on tootsie rolls? Aaron pondered this for a few seconds as we neared our destination. “Then it’s licorice!” he exclaimed as we turned at the light. I remember the location precisely, because these momentous moments stay ingrained in my brain. Is a tootsie roll licorice? Aaron has a way of narrowing my life down to these questions. I’m hoping he’ll forget the tootsie rolls for a while and think about………turkey. I can hear it now. What is turkey? Is turkey a bird? What kind of bird? Does it fly? But birds fly. Geese fly over our house. I know! A turkey is a goose!! See what I mean by typical? Happy Thanksgiving! Enjoy your turkey……..no questions!! Author hesaidwhatksPosted on November 27, 2013 February 28, 2016 Categories Adult Autism, Asperger's Syndrome, ThanksgivingLeave a comment on What IS a Tootsie Roll?! It was a Saturday afternoon several weeks ago when my phone jingled, and I picked it up to see that my good friend, Atha, had texted. We exchanged greetings and then she asked how my day was going, wondering what I was doing. So I told her what I was doing. Ironing. Yes, I was ironing on a Saturday afternoon. Immediately Atha texted back and as I looked down at my phone, I read these four words. Established in your purpose. That simple phrase jumped off of my cell phone screen and ingrained itself into my heart the very moment that I read it. Wow! In fact, I told Atha how I loved what she had just said. And knowing me as she does, she told me to feel free to use it someday. I could just hear her laughter. Part of the impact of those words came from who said them. Atha…………Dr. Athalene McNay to be precise……….is highly educated. She has also started a business coaching those who have ADHD, and she is a college professor. I respect her abilities and insights. Yet more importantly, she is my dear friend. God allowed our paths to cross over ten years ago, and both of us are so thankful that He did. So her words were both professionally uplifting to me and encouraging to me as a friend. Atha and I are very much alike in some ways, but our paths at this time in our lives are very different. We both have purpose, and Atha values my purpose as much as she does her own. I’ve been dwelling on that phrase more and more lately……..established in your purpose. Established in MY purpose. So what is my purpose? In what am I to be established; to be firm and stable? I remember when Gary and I were dating 35 years ago. As we became more serious in our relationship we were discussing many things. One important thing that I was thankful that we agreed on was the fact that if we got married, and if God gave us children, I wanted to be able to stay home with them if at all possible. Gary and I both had the same mind regarding that issue, and as the years passed and our three children were born we were able to see that desire fulfilled. That was a purpose that we had together, but it was definitely my purpose for as long as I could remember even before I knew Gary. Days of tiredness. Days when I feel guilty for not spending more time with him, or for losing my patience with him. Days of resentment. Days of routine boredom. Days of such intense empathy for him that I feel like my heart will explode. Days of such love for him that I fight the tears. Days of wishing I had any other life but this one. Up and down, up and down. But isn’t this just life for all of us? Whatever your purpose is……….whatever road God has set you on………can have many potholes and speed bumps. It’s always tempting to compare our road’s journey to someone else who does it better or easier or more exotically. I often have to force myself to look straight ahead as I refocus on my priorities. My purpose, like Atha said. And to be established in that purpose. Firm and stable, as the definition says. Even if it means that I’m ironing on a Saturday afternoon, struggling to keep that one crease in Gary’s pants in the place where it belongs. Ugh! Even if it means listening to Aaron say the same things over and over and over……and clap……….and yell……….and get angry……and chew with his mouth open as he leans over the third bowl he thinks he MUST have with his snack. The mundane purposes of life can really stretch my ability to be established, let me tell you! Maybe someday that will be God’s purpose for me, but for now it is not. So for now I will be established in my purpose…….the purpose that God has planned for me this very day. And I will seek to, as Paul said, do all things to the glory of God. Don’t even ask how many times I fail in that purpose alone, but God is so patient with me and for that I am ever thankful. Being established in my purpose. It may not be dazzling and exciting, but this purpose that God has for me is just right. And so is yours. Be established in YOUR purpose. 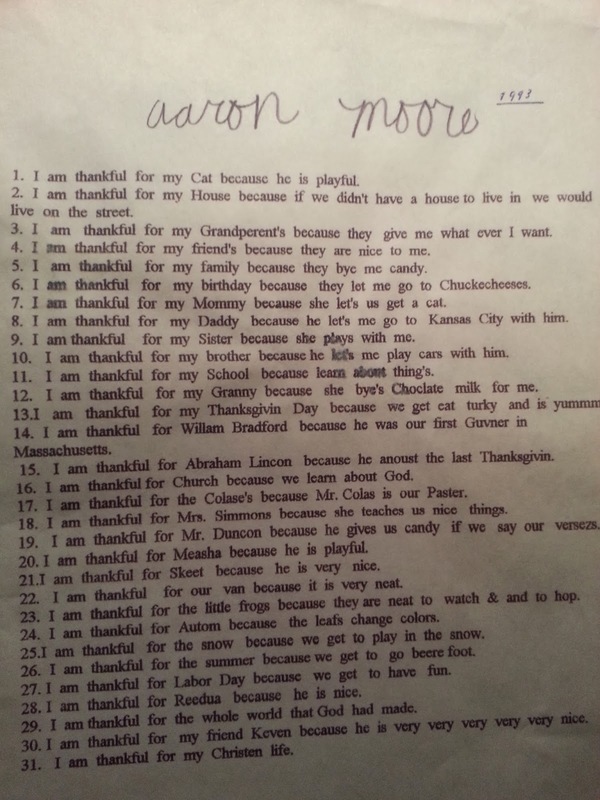 I wanted to share this Thankful List that Aaron typed up when he was nine years old. It was 1993, and Gary was stationed at Fort Leavenworth. We had just returned that spring from living for six years in Germany. This is a copy of Aaron’s list that we had given to my parents, with Dad’s handwritten date at the top……..so we wouldn’t forget. I’m so glad he did that. And I’m glad that we have this very endearing record of just what Aaron Moore was thankful for at the wise age of nine. I know it’s not the best quality but I hope that you can read it. Sometimes when we’re out shopping Aaron will pass some flowers and he’ll tell me of a day that he was at a store with Paradigm, and that he saw flowers and that he wanted to buy them for me. I always tell him that this is very sweet but that he doesn’t have that much money, and that even if he did he shouldn’t spend it on flowers for me. Aaron doesn’t really seem like a flower kind of guy. He likes to show me artichokes and eggplant, or a jar of pig’s feet, or a skeleton in the Halloween display. He brings home all manner of things in his pockets which he pulls out to show me………from plastic rats to pens. Some items I make him return to Paradigm because I’m sure he pilfered them without permission. He has given me unusual rocks that he finds in parking lots or at the park, and sometimes a strange piece of ornamental grass from the zoo that I know he should not have picked. But he does, and in his pocket it goes, and he’s just sure that Mom will be so happy that he was thinking of her. So last week when I heard the door bang open announcing Aaron’s arrival home from Paradigm, and I met him in the kitchen, I was more than a little skeptical when I saw what he clutched in his hand. It was a small bouquet of pretty flowers which he thrust out to me and said, “Here, Mom.” I had no choice but to grab them as he quickly handed them to me and then hurried past me as he headed to his room. He gave no explanation and certainly showed no emotion as he quickly gave me the flowers. “Wait, Aaron,” I said. “Where did you get these?” All sorts of scenarios were entering my mind. Did he take them from Dillon’s or Wal-Mart? Surely not. Did he grab them from someone’s desk at Paradigm as he went out the door to come home? But they hadn’t been crammed in his pocket, and I knew that his driver must have seen them. I was puzzled. “Barb let me have them,” he answered. I was still confused as Aaron tried to explain that Barb really had let him have some flowers. They must have been flowers that she had received and that she shared with Aaron, I reasoned. I told Aaron to wait while I went downstairs and grabbed a vase. I let him watch me put the flowers and water in the vase, and then I placed them carefully in just the perfect spot. I thanked him warmly and gave him a big hug, which he halfheartedly accepted. He was in a hurry to get upstairs, to change clothes, and to get on his computer. As he walked away, I had my phone in hand and immediately texted Barb. I just had to know the real story, and to be sure that she wasn’t missing some flowers. How touching! How very sweet of Barb to not only see that Aaron got his wish of giving Mom flowers, but to see that I was given a happy heart by this gift from my son who can’t just run to the store and grab flowers for Mom whenever he wants. I’m still not sure how it all came about, but I was doubly blessed on that day. And Aaron? He was pleased that he finally got to bring me some bona fide flowers……..not just a piece of ornamental grass or a dandelion or a flower pulled from the bush in our yard. These flowers were the real deal. He showed them to Gary when he got home, but all in all Aaron didn’t show a great deal of outward excitement about the flowers. This is so typical of Aaron. Just do the deed and move on to the next thing, showing little emotion or fanfare. Yet I know he was very happy to bring me flowers, and he was very happy that I was very happy. He’s just not going to express it with smiles and conversation and hugs like we do. But I know that deep in that mind of his, he is very aware of the pleasure he gave his mom and of the love that was returned to him. 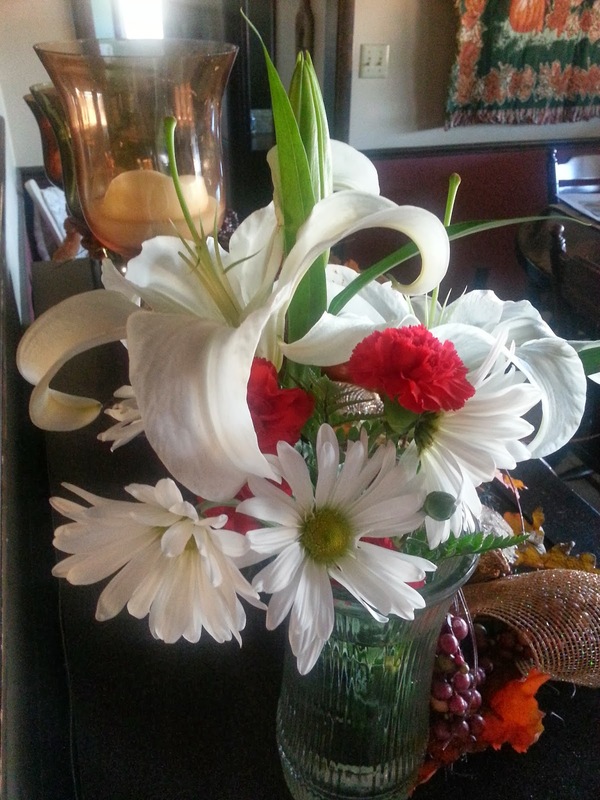 His wish was fulfilled……….and I will continue to enjoy how sweet it is that Aaron wants to bring me flowers. This past Friday was Aaron’s birthday – his number 29, to be exact. That seems so strange to me, thinking that next year he’ll be 30 years old! He loves his birthday, and weeks before the big day he’s already planning it. Well, planning where to eat, most of all………..and then talking about gift ideas. For a long time he wanted to go to Cracker Barrel for dinner, which would be the third year in a row. But one day a few weeks ago he said, “Mom, I decided I want to go to that Mexican restaurant.” I asked him which one and he answered, “You know, the one with those Mexican dancers.” Mexican dancers? I was trying to remember where on earth we had been that he had seen Mexican dancers……..and how I could have missed the Mexican dancers………when it hit me. “Aaron, do you mean Texas Roadhouse?” I asked him. “Yeah,” he replied. “You remember those Mexican dancers there?” I proceeded to explain the difference in Mexican and cowboy, wondering where he got the Mexican theme from other than an old cowboy movie filmed near Mexico. 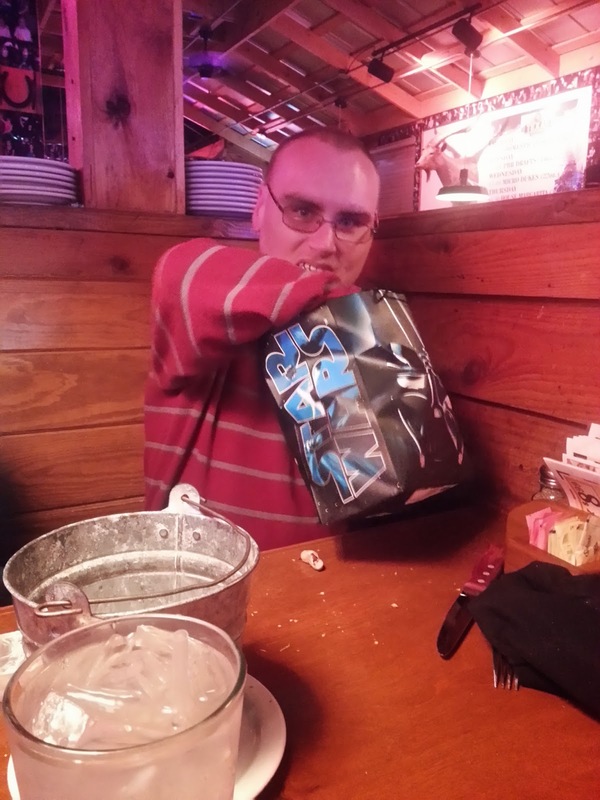 Anyway, we got that figured out and so Texas Roadhouse it was. Of course, Aaron wanted Rosie and her mom and dad to come. And he invited staff from Paradigm, so Misty got to be there as well. He’s so funny, planning and talking and looking forward to his special day so much. But when the day is finally here, he really doesn’t seem all that excited. He gives a little embarrassed chuckle at all the “Happy Birthday, Aaron!” greetings, or a quick smile as he ducks his head and walks away. 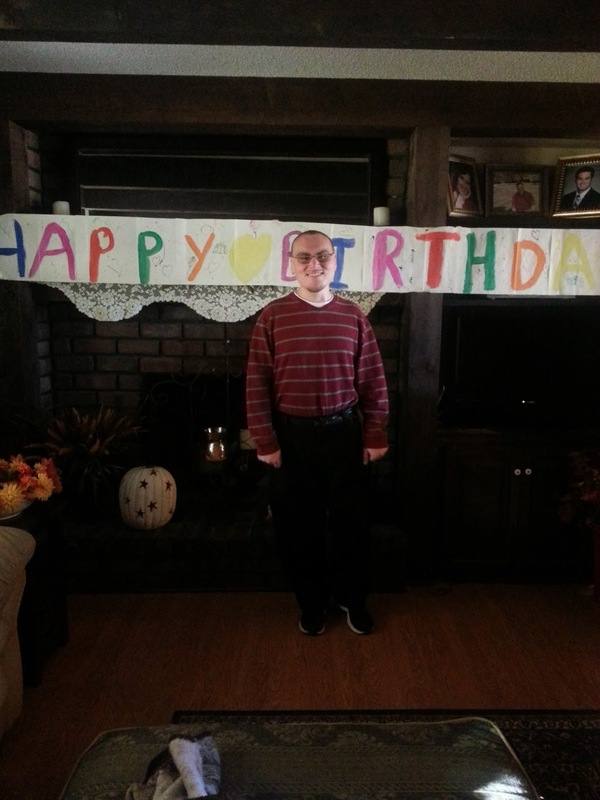 He tolerates the annual birthday picture with our traditional birthday banner. It’s like he wants to check things off his “My Birthday Is Finally Here” list……and then just get on with normal life. When he walked in the door after getting home from Paradigm, he saw the wrapped gifts and the cards laying on the table, but he didn’t even act like he noticed them. He talked for a few minutes about his day, and then told me to come and get him when it was time to leave for Texas Roadhouse. Soon he was on his computer, unwinding and returning to his world for a few minutes. He got off happily when it was time to go, the thoughts of restaurant food making him willing to leave his game. It was a nice evening full of juggling conversation and food with him and with Rosie, and us adults fitting in some words whenever we could. I loved watching him and Rosie sitting beside each other, across from me, and enjoying their friendship……..done their way. Dear Aaron, always worried about this marriage thing. 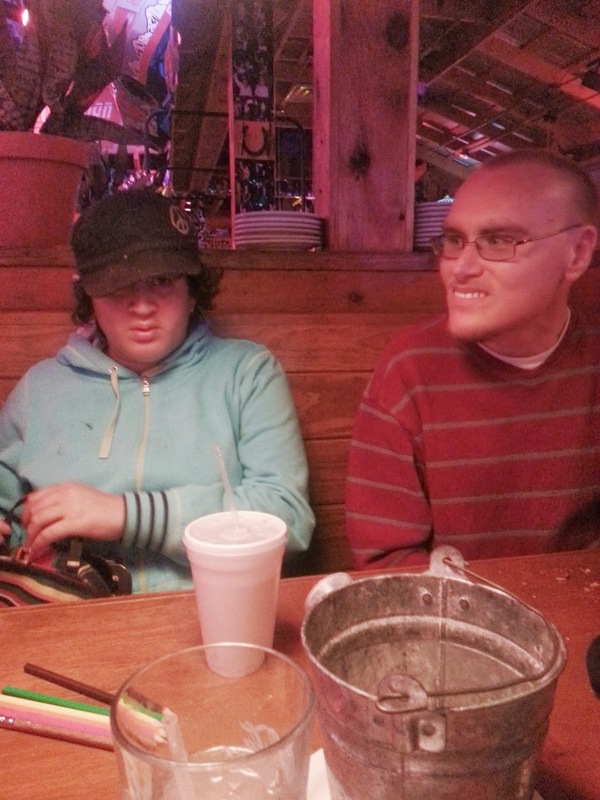 I assured him that being special friends doesn’t mean marriage, and now as he sat beside Rosie during his birthday dinner I was just happy to see them being who they are. This means that they didn’t talk much to each other at all. Aaron was busy stuffing as many rolls in his mouth as he could muster after being sure I had spread the PLAIN butter on them from edge to edge, and being sure I scraped ALL the ranch dressing out of the little container for his salad, and eating peanuts during each free moment, and talking as much as he possibly could. Rosie was coloring some with her nice colored pencils that she loves, and holding the pencils when not coloring, and reminding first Misty and then her Mom to tell about this and tell about that. Rosie was excited to give Aaron his gift, and typical Aaron didn’t act near as excited to receive it. He opened the gifts from Rosie and from Misty, and he sort of said thanks, but he had rolls to eat and chicken critters to chew on……..and opening gifts, while fun, means he has to do that embarrassing thank you, after all. Deep down he’s pleased with gifts, but he wants to keep those emotions deep down and not put them out there for all to see. I loved it when I told Rosie and Aaron that I wanted to take their picture together, and immediately Rosie put her arm around Aaron. She did that last year, too. It’s just so genuine and real……..and is something Aaron would not do. Soon it was time to go, and Aaron barely said goodbye or thanks to anyone. He was off to his next assignment that needed to be checked off his list………opening presents at home. He got through that in good order, moving from one to the other with little emotion but definitely taking it all in. Gary and I laughed at the funny cards, but we had to make Aaron stop to fully read them and to notice how comical they were. He was moving from point A to point B to point C……….enjoying the cards and the gifts but definitely nearing overload. 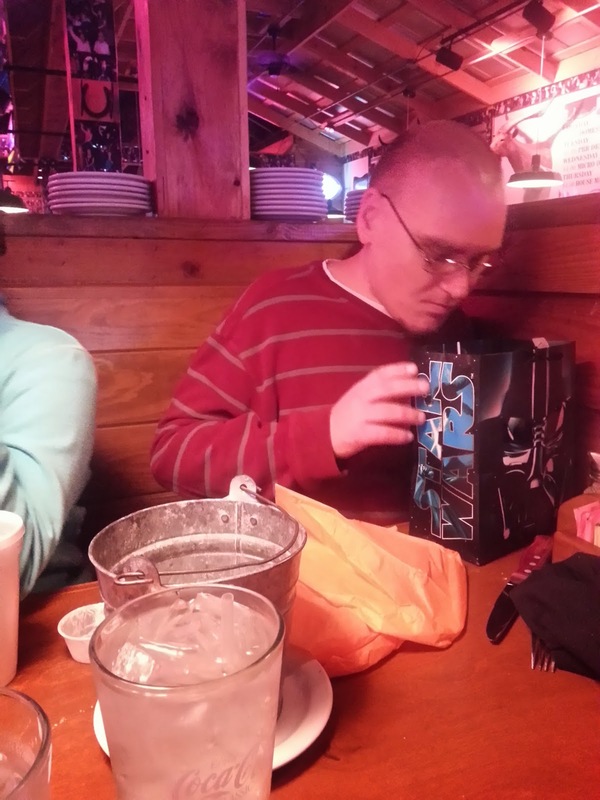 We made sure he reopened Rosie’s and Misty’s gifts and cards so he could realize what they were all about. Soon, though, he was off to his room. No time or desire to sit there and linger over some nice conversation with Mom and Dad, and too full for any of the apple pie I had made him. He got into his pajamas as quickly as he could, and immersed himself in his game before thumping downstairs a few times to talk awhile. His weekend was nice as well, with a little shopping, a little pizza, a little apple pie, a little time with Mom and Dad and Jackson, and just life as Aaron likes it. I went in his room on Saturday night to say it was time for bed and time for me to take his keyboard. 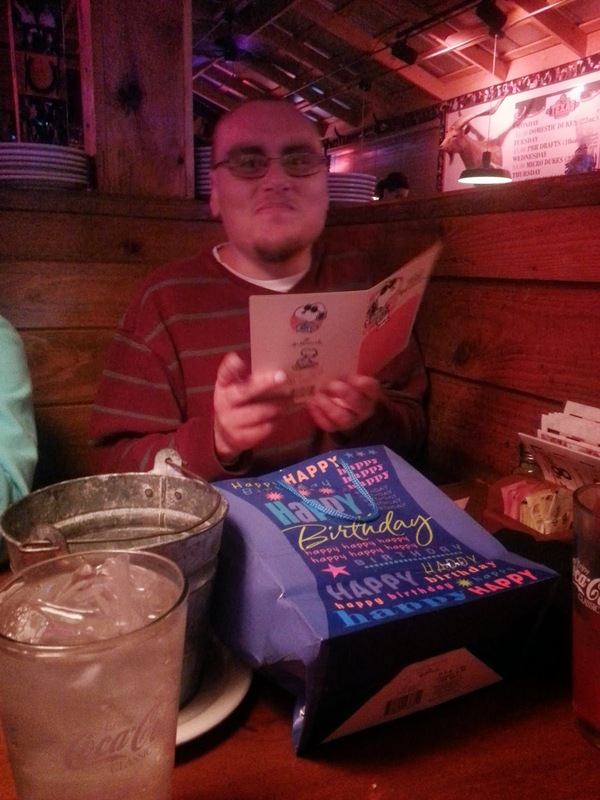 He was just finishing up his new movie that he got for his birthday…….Pacific Rim. 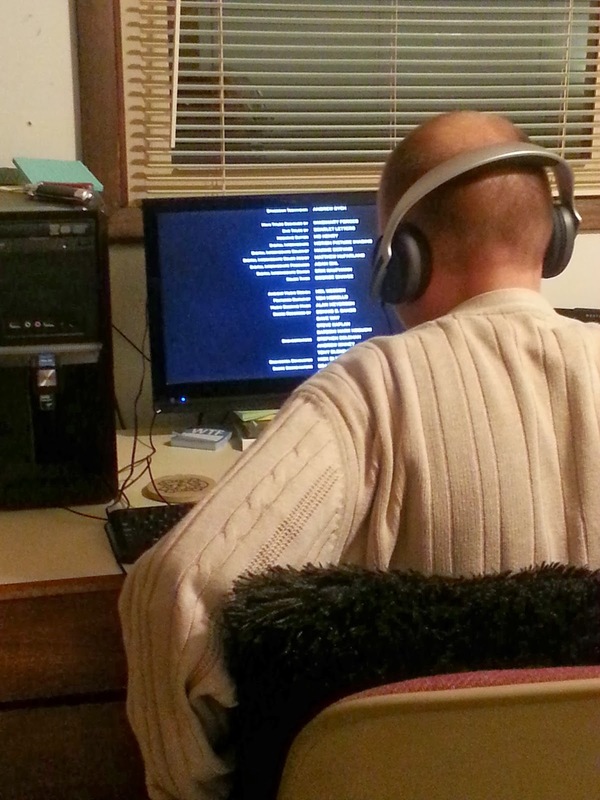 A few minutes later I stuck my head back in his room and was not at all surprised to see him completely absorbed in watching the credits. I’ve told about how he watches movies from the very beginning to the very end. The very, very end with the picture of the lion and the minuscule print. This is another part of life as Aaron likes it, so I just smiled and walked away until the movie…….in Aaron’s opinion…….was totally over. Nothing new here. That, to Aaron, is indeed something new under the sun and worth noting. And that, to me, is something to be expected and worthy of a smile. I dug into my memory drawer today when I had a few free minutes. There was one thing I was looking for, and soon I found it. Or found them, I should say. I need to organize that drawer that is stuffed full of random cards and letters and other mementos. The unmistakable hand writing on the particular envelopes I pulled out, though, easily identified the sender of these treasures and made them easy to find. I’m sure there are others still there in my drawer that I will find later, but for now I was happy to find the ones that I did. I was actually surprised at the many cards and letters that I found in that quick search. It’s a testament to the gracious caring of the amazing person whose heart touched so many of us by the cards and letters and copies of poems and articles that she spent countless hours mailing to hundreds of people, I’m sure. Alice Zwemke……..Mrs. Alice, as she often signed her name. I’m so grateful that Gary and I had the wonderful privilege of knowing her here in Wichita. She was the embodiment of kindness and gentleness, her voice soft and her smile so full of sweetness. She most definitely possessed the gift of encouragement, and she exercised that gift to the fullest of the abilities God gave her until her age and poor health made it more and more difficult to do so. She would encourage by her kind words and her soft touch, but the way that stood out to so many of us was in her mailings. If I sang a song at church, I would almost always get a card from Alice thanking me and giving me encouraging words. She would thank Gary for teaching or for praying, or thank us for various other ways that we served. Always lifting us up…………always showing us love. 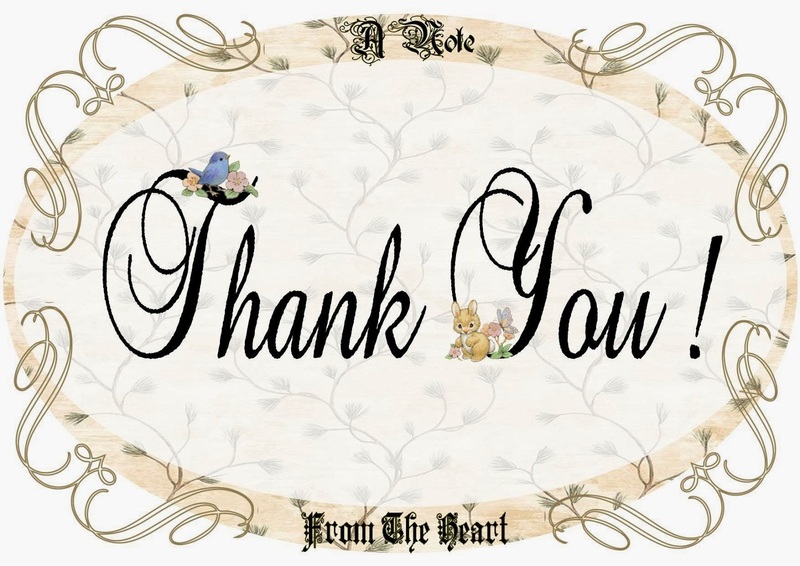 However, even more touching than the many cards and articles and letters that she sent us….and the many hugs and sweet words that she spoke to us……..was the complete love and acceptance that she showed to our Aaron. She never looked at him like he was odd. She never seemed put off by his brusqueness. I never saw her cringe when he was loud or angry. 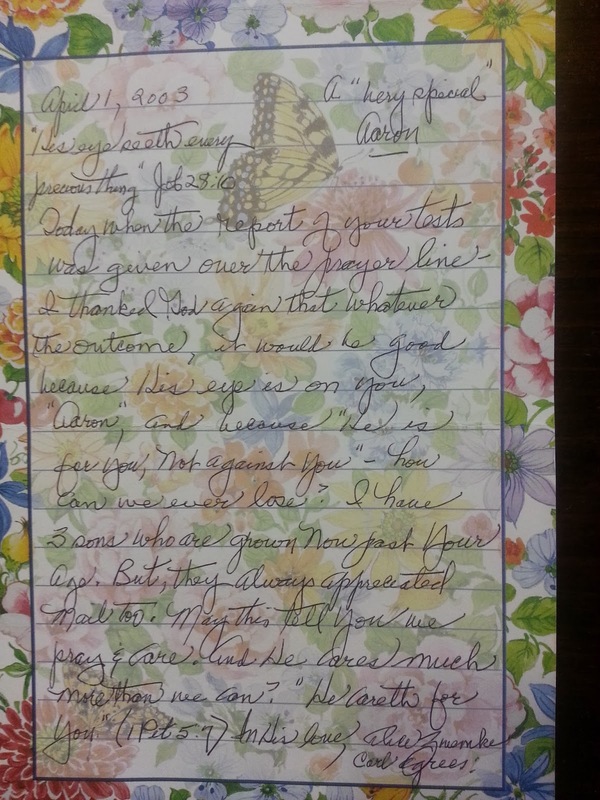 After Aaron was in the hospital for five days for a video EEG in 2003, there in our mail came a letter from Mrs. Alice. As she so often did, she referred to Aaron as “A very special Aaron.” She quoted a verse that she put in other cards to him: “His eye seeth every precious thing.” I remember reading these cards to Aaron, the cards from Mrs. Alice, and having a hard time being able to finish them because of the lump in my throat and the tears burning my eyes. 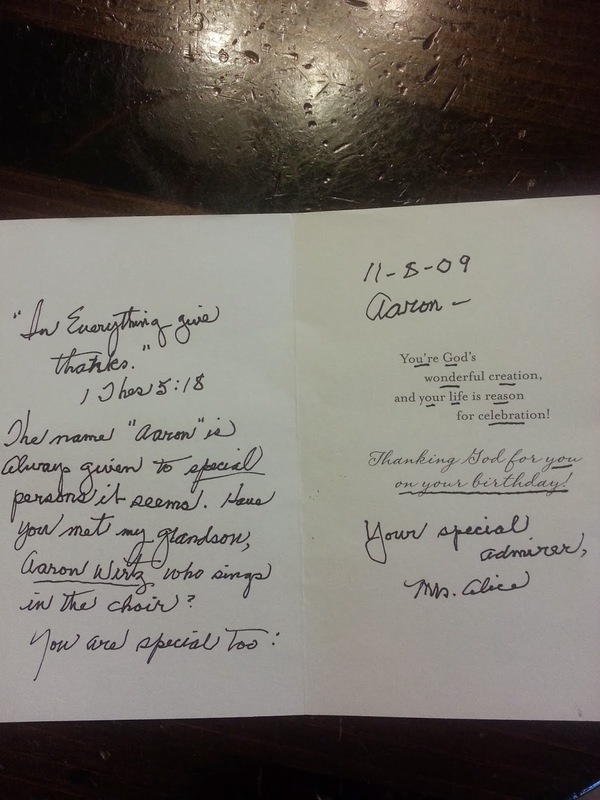 Here’s a card from Mrs. Alice for Aaron’s birthday in 2004. Again, she told him how precious and how special he was. 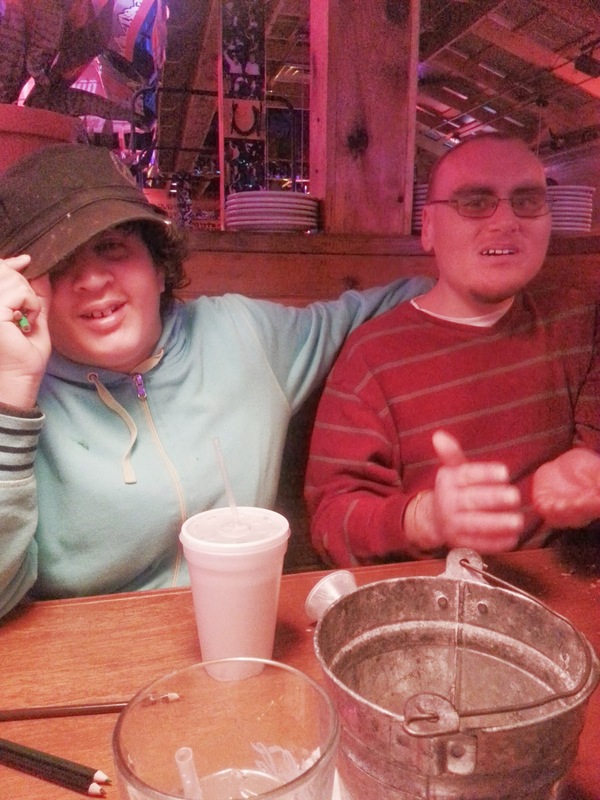 She said that she hoped at the Thanksgiving meal that she and Aaron could share a bit. Fast forward to 2009. Mrs. Alice sent Aaron another birthday card. You can see from her handwriting that age was taking its toll on Alice. Her writing was shakier, but her sentiments of love were as strong as ever. Once again she reminded Aaron that he was special. Mrs. Alice loved that word. 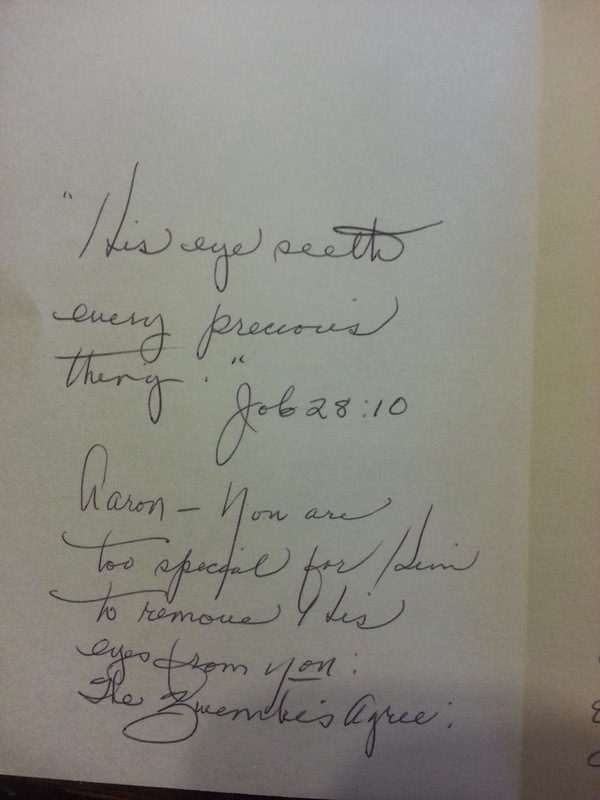 She used it often with Aaron……and then on this card, she used that word as she signed her own name – your special admirer. Yes, Alice was indeed special. Aaron didn’t realize just how special Alice was as I would read him what she wrote. He enjoyed getting the cards and he knew who she was, but he didn’t fully realize just how much she cared for him or what she was trying to convey to him. But Gary and I knew, and we were and always will be so very grateful for her sweet love for our special Aaron. Tomorrow, November 8, is our special Aaron’s birthday. And tomorrow is the day that many of us will attend the funeral service for our very special Alice. I think it’s pretty special that we get to attend Alice’s graduation service, as she would want it called, on Aaron’s birthday. She would smile at that thought and think of just how special it all really is, too. We love you, Alice, for all that you were and all that you meant to us…..but especially for the love that you generously poured out to Aaron. What a special lady you were!